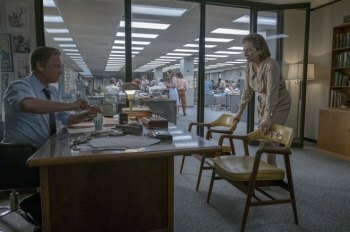 Home » Entertainment » FIRST LOOK: The Post Underscores Media is for "the governed," not "the government"
FIRST LOOK: The Post Underscores Media is for "the governed," not "the government"
War is hell. Soldiers perish and are mutilated along with civilian collateral damage. Deaths and injuries impact far beyond immediate families. Yet, the so-called military industrial complex know that combat means millions for bullets, planes, tanks and bombs. The stakes of combat may have greater values on the table -- but in the case of the Vietnam War multiple administrations and top military and civilian brass kept the purposefully buried the truth for the public --- the war was not winnable. A reporter spent a year embedded with the troops. He saw victories and defeat. He concluded the United States was at worst maintaining the status quo. But, it wasn't --- over 100,000 additional troops had been injected into the humid jungles of Nam. America was losing; the Secretary of Defense knew it, he continued to pretend in front of microphones and cameras that Old Glory would prevail. Ultimately, after gaining access to a historic analysis of decades of foreign policy still labeled 'top secret,' the documents were turned over in the name of conscience to the New York Times. 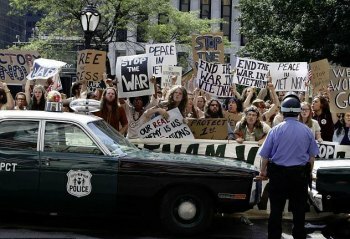 Printing the Pentagon Papers set up a war of its own --- would the Freedom of the Press and First Amendment debate prevail, or would the "academic" documents prepared for analysis generations later be labeled as a treasonous act by the publisher? 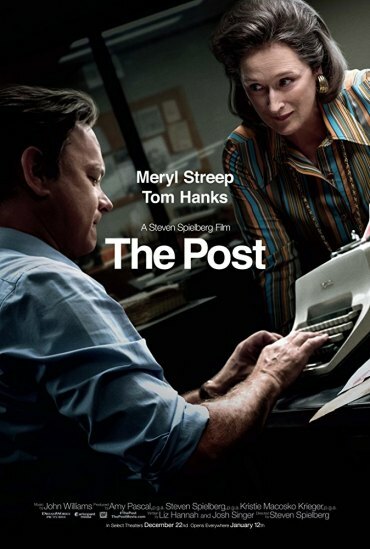 Tom Hanks ( as Post editor Ben Bradlee) and Meryl Streep (as Katherine Graham, the first female publisher of a major newspaper) are at the top of the decision making chain at the then family owned, locally influenced Washington Post, which desires to step up the quality reporting ladder. They receive their chance after the New York Times publishes excerpts from an informants set of 4,000 pages of documents proving that citizens have for 30 years been lied to by the United States government concerning defense matters. Steven Spielberg intuitively directs this all star cast which must debate constitutional crisis fundamentals and risk prison for dedication to a free press and first amendment by reporting to the governed, not what the government wants told. Undertowing the political drama, Ms. Graham faces a good ole boy business world in which she must overcome lack of mentor support. She's ignored, considered insignificant, regarded as a token executive in place only through an untimely death. Until 45 she didn't work in the family business. She did the coffee, tea, and dinner party circuit mingling with top politicians as friends, not serious sources. As publisher, Streep's calm, poised, and inquisitive. Asking her all male department heads for decision making advice (sometimes in an admitted indecisive state), the occasionally limping Oscar winner exhibits nearly overwhelmed female syndrome in front of a young family member. Otherwise, she adopts the masculine stances well, including deferring decisions and doing excessive "homework" to overly qualify HER opinions --- the same one's that males can state based on 'experience', not research. Low keyed conversations with highly placed political operatives invigorates her passion --- her journalistic and intellectual gifts kick in allowing her to eventually earn (for herself) an equality mindset to neutralize self esteem belittlement from the exclusive male business types. Overlapping male and female paradoxes steer how to interact with "sources" and "friends," particularly when the latter have such powerful positions that a small favor could/would influence national truths. Overlaps often can not be shut out, but an advance 'boundary' discussion could assist, except "my word's my bond" is a myth for many. Although the events demonstrate the tyrant traits that lead to the Richard Nixon Watergate resignation, the press versus administration confrontation evokes deep ethical examinations and/or justifications. Spielberg maintains a tense, cluttered, beat the clock pace. The story is inherently simple --- the continuation of the "big lie" has more and more drafted young Americans dying in the humid swamps of Vietnam. When do historical "secrets" justify maimed and deaths when (in the words of one source) 70% of the heightening war drums is for the U.S. to "save face" from losing a war that will not topple dominos. To call attention to best scenes and quotes therefrom tip toes in to the spoiler realm. However, I'll sneak one dramatic judicial faceoff on the "revealing national secrets." A judge asks would the paper have printed secret D-Day plans should they have become available in advance. The paper's lawyer and executives emphatically responded ---- NO! Yes, "The Post" has a multitude of allusions to current Presidential 'fake news' press wars. Hopefully, insights will inspire more persons of power to stand up and be counted in the national debate. What it fails to insert --- invention would have been necessary --- is media overstepping opinion and fact boundaries through continuous "expert" interpretation and speculation. The film frames presidential decisions (and those of cabinet members), but roll the presses and publish applies from a tiny county seat , a city, a state capital and daily decisions that impact from a few to millions. Sorting out ego "spins" do not come gently. Truth is not often obvious. There are black holes that must gradually fill by discovering facts , balancing credible sources (that go beyond 'leaks') and praying for document dumps that vanquishes reasonable doubts. Essentially, Spielberg has transformed this newsroom to a symbolic suggestion of life's journeys underscoring that mere passion does not guarantee success, and if success ensues, the result may bring unintended consequences. As an example, retaliation insurance is not guaranteed. Nixon barred a Post writer from a high society wedding. A wrong decision would have bankrupted and closed the paper. The film emphasizes banking and stock sales, but fails to mention the influence of large advertiser boycotts.